MARDIGRASS 2000 PROGRAMME "GOOD MEDICINE"
8pm DIGITAL HEMPY in the Town Hall. 12 plus DJS, $10/$12 Chill out Zone at the E-Bar. 11am CANNABIS FORUM  Town Hall. 11am INDUSTRIAL HEMP - An Exciting Future with Dr. Andrew Katelaris, industrial hemp pioneer ,activist and inspiration. 1pm GLOBAL POT AND POLITICS -Where its all Heading! Speakers include Dana Larsen, Editor of Cannabis Culture Magazine, Canada. 4.20pm Participate in the Millennium Marijuana March and Launch of FREEDOM RIDE, a tour of NSW gaols culminating in Sydney Hemp Olympix., a tour of NSW gaols culminating in Sydney Hemp Olympix. Also launch of The CHURCH OF THE HOLY SMOKE. 6pm HARVEST BALL - Town Hall, top local talent including Folk'N'Cowticks,Pagan Love Cult, Tonk & Turner, Go,Solkin,Slippery & Red Eyed Frogs plus special dance guests - $10 & $12. 11am FREE LEGAL ADVICE SESSION in Town Hall, Steve Bolt and Hugh van Dugteren. 11am SEED SWAP- Location to be announced. Cannabis Cup Judges raffle draw! Biggest Stalk & Furry Freak Brothers Look Alike Contests. 3pm HEMP OLYMPIX - Finals of all events. 4pm BUSKERS BONANZA - Collection of tokens. 5pm CANNABIS CUP - Judging of the best produce. 10pm Hemp Comedy Club at the Oasis Cafe with Steve Sorrensen and Alan Glover. 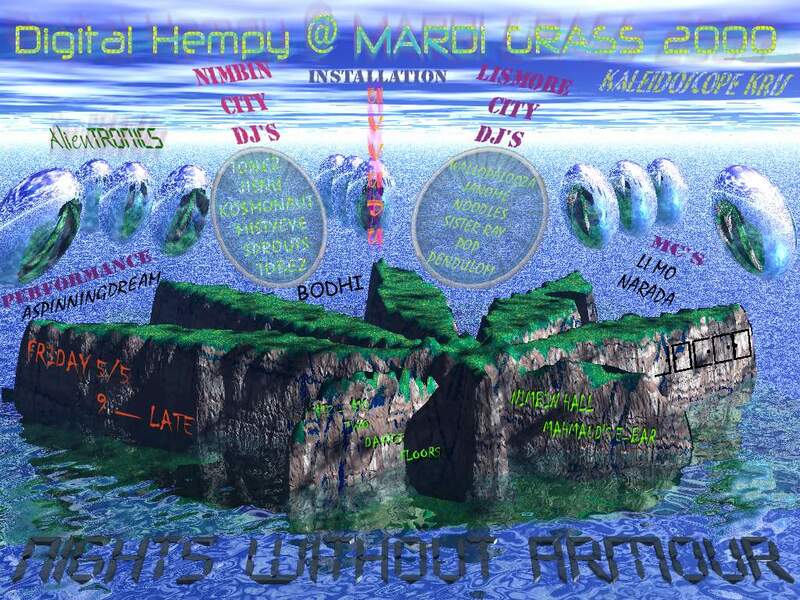 MARDIGRASS MARKETS AND HEMP EXPO. Childrens Puppet show on the HISTORY OF HEMP (at , Hemp fashion, POT ART, Cannabis Cup judges raffle, DUTCHIES CAFÉ, Chill Out Zone, Youth Art Exhibition, Tree Planting and don't miss our Cafes and Restaurants with entertainment all weekend. - Nimbin Headers Soccer First Division - Saturday 1pm with the girls playing at 9am Sunday. THE CANNABIST INTERNATIONALE, a webcast global link up and conference of law reform activists. Register at the wwwagon in Peace Park.